FoxTrot Labs, LLC is the owner and operator of this website and is committed to operating it in a manner which respects and protects your privacy. We do not collect any personal information other than that which we deem necessary to operate this site and to act on visitors’ voluntary e-mail communications. 1. Your device’s IP address. This is a numeric code assigned to your device which lets a web server know where to send the images and text you see on your screen. Your device sends it out automatically every time you visit a web page. It is generally not considered personally identifiable information, as different users can share the same IP address in a household, dorm or office, for example, but we thought you should know it does get shared with us. We, or our hosting provider, may keep logs of visiting IP addresses and related information (date and time of visit, which pages viewed, browser version, etc.) but only and for such time as is needed to support internal operations of the site or as required by law. Also note that while we employ Google Analytics to help us make decisions based on web traffic, it is only in such a manner that (a) IP addresses are anonymized before being saved by Google and (b) user demographic and interest data are disabled. 2. Your Google Ads cookie, assuming your browser allows cookies. You don’t share it with us, per se, but because we use Google as our ad provider, you’re sharing it with them. Cookies are small text files advertisers and websites frequently place on your device to let them save information about you. In the case of the Google Ads cookie, it uses this information to serve advertising it believes would be of interest to a particular user. If this is a concern and you’d like more information, we encourage you to visit www.google.com/settings/ads. If you’d like to clear your device’s saved cookies or block them altogether in the future, consult your browser’s help menu for instructions. 3. Your e-mail address. But only if you choose to sign up for our mailing list or e-mail us for some reason. How is it used? To allow us to write back to you or to send you relevant news. This is sort of obvious, but we thought it important to assure you that we aren’t going to sell this information or add you to some third-party mailing list. If you are under 13 years of age, please do not e-mail us or sign up for our mailing list. If you are under 13 and need to contact us, ask a parent to do so on your behalf or alternatively you may write to us yourself via traditional postal mail using the mailing address information found on our Contact Us page. FoxTrot.com contains links to outside sites we think might be of use or interest to at least a few of our readers. These sites may have privacy policies very different from ours, so we recommend users familiarize themselves with those policies as well, should they choose to visit these sites. This is especially true with social media sites. We currently feature links to Bill Amend’s public social media accounts on Twitter and Facebook. These links are not meant as endorsements of those sites or services, nor as encouragements for our visitors to join them, nor as signs of approval as to the quality or content of Bill’s occasional blatherings, but simply as helpful links for users of those sites or services to locate or identify Bill’s accounts. Social media sites tend to allow for the sharing of a great deal of personal information, so we recommend that if you choose to visit one of these sites, you review the service’s terms and privacy policies with utmost care upon arrival. To be clear: We are not responsible for any information you share once you leave our site. 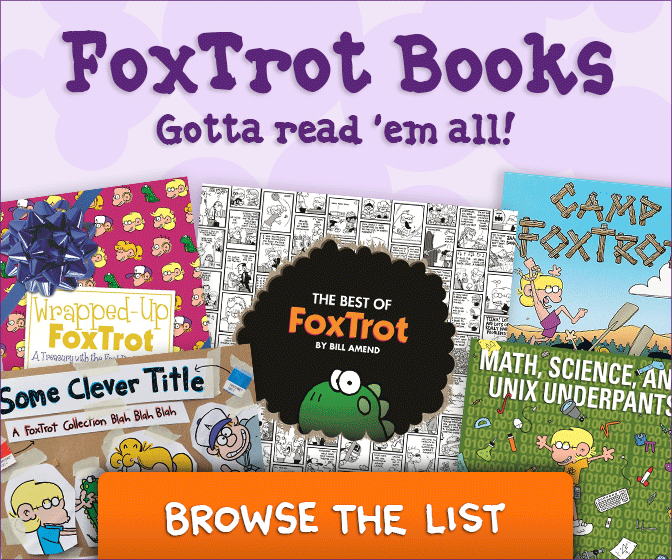 Although FoxTrot.com is absolutely targeted to a broad and general audience, the FoxTrot comic strip has shown sufficient historical attraction to kids and teens that we think it proper to meet the requirements of current COPPA rules whether or not we are legally obligated to do so. We believe that parents should be fully informed as to the sorts of personal information we might collect from their child, how such information is used, and what recourse they have to review it, delete it, and prevent its collection in the future. First, parents should know that we do not knowingly collect any personal information from children under 13. The IP address which our server automatically collects from each visitor’s device is not associated by us with any personal information about your child and is used solely in support of the internal operations of our web site, as is allowed under COPPA. Our hosting provider’s IP logs are cleared every 24 hours under normal circumstances. Our advertising provider, Google, is a widely used and trusted supplier of ads throughout the Internet. They do use a persistent identifier or cookie which resides on a user’s device to help their servers decide which of their many ads to serve. Parents can learn more about how this works as well as how to opt out of any further tracking at www.google.com/settings/ads. Parents should also know that most browsers allow a parent to clear any existing cookies on a child’s device and to prevent the saving of cookies altogether if desired. Finally, while our “Contact Us” page makes clear that children under 13 should not e-mail us directly but rather have a parent or adult contact us on their behalf, in the event that we do receive an e-mail which we can identify as coming from a child under 13, we will either delete it without responding, or delete it after responding as allowed under COPPA. The only circumstances under which we might knowingly save a younger-than-13 child’s e-mail communication is if it is included within the text of a parent’s e-mail which we will consider as de facto permission for us to have whatever information it contains or in the special case where the reason for non-deletion is necessary and allowable under COPPA. At any time should a parent have reason to believe that we possess personal information about their under-13-year-old child collected online by this website, they may contact us and if such information exists, we’ll share it with them and delete it if that’s their wish. In the event that a parent directs us to prevent the future online collection of their child’s personal information by our site, we’ll work with the parent to figure out the most practical method.